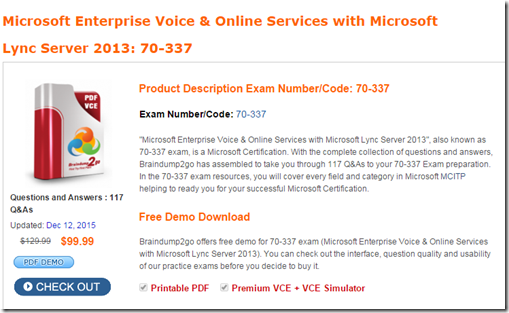 New Released Braindump2go Microsoft 70-337 Dumps PDF – Questions and Answers Updated with Microsoft Official Exam Center! Visit Braindump2go and download our 70-337 Exam Questions Now, Pass 70-337 100% at your first time! – Call Park enables an Enterprise Voice user to put a call on hold from one telephone and then retrieve the call later by dialing an internal number (known as a Call Park orbit) from any telephone. – At any given time, a maximum of 25 percent of the users in the New York office are on the phone. A maximum of twenty percent of the calls are to the PSTN. (4000 users in New York Office. So 4000 * 0.25* 0.20 so maximum of 200 users can be put on hold. We need a range size of at least 200). 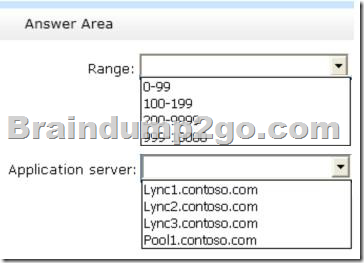 You need to create the DHCP options required for Lync Phone Edition devices. – DHCPConfigScript.bat cannot be used against any DHCP server other than the DHCP server feature included with Windows Server operating systems, unless you modify it. Which subnet or subnets should you identify for each office? To answer, drag the appropriate subnet or subnets to the correct office in the answer area. Each subnet may be used once, more than once, or not at all. Additionally, you may need to drag the split bar between panes or scroll to view content. The 192.168.x.x configurations as per defined in scenario. Then we need a public network address for New York. We must not use the /32 network mask. You need to identify which Lync Server 2013 components must be deployed to each office to support the planned changes for voice resiliency. Which components should you identify for each office? To answer, select the appropriate component for each office in the answer area. 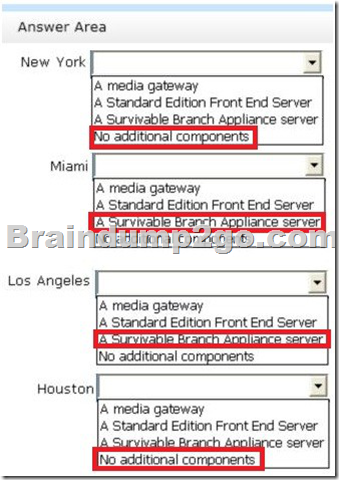 – The Survivable Branch Appliance is a purpose-built appliance to increase voice resiliency in branch- office scenarios. 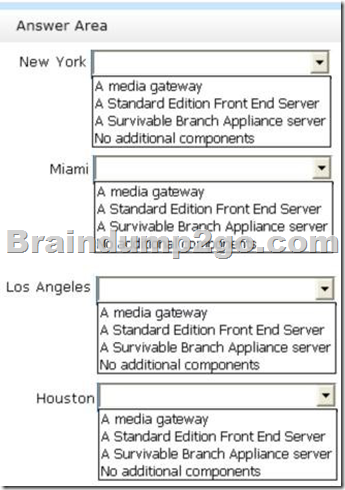 – Miami and Los Angeles both need a Survivable Branch Appliance. You need to create the new auto attendant contact object. You need to ensure that least cost routing is used in the Los Angeles and Houston offices for local calls after the gateway is deployed. Which route should you assign to each PSTN usage? To answer, drag the appropriate route to the correct PSTN usage in the answer area. Each route may be used once, more than once, or not at all. Additionally, you may need to drag the split bar between panes or scroll to view content. Your need to recommend which DNS records must be created to support the planned migration to Lync Online. Which DNS records should you recommend creating? To answer, configure the appropriate record name and target in the dialog box in the answer area. – Port, protocol and firewall requirements for federation with Microsoft Lync Server 2013, Lync Server 2010 and Office Communications Server are similar to those for the deployed Edge Server. Clients initiate communication with the Access Edge service over TLS/SIP/TCP 443. Federated partners however, will initiate communications to the Access Edge service over MTLS/SIP/TCP 5061. You need to recommend a client configuration strategy to meet the requirements for the planned migration to Lync Online. Physical Locations Litware has a main office and a branch office. The main office is located in New York. The branch office is located in Montreal. Each office has a firewall between the internal network and the perimeter network. Each office has a firewall between the perimeter network and the Internet. The network contains an Active Directory forest named litware.com. The infrastructure contains 12 servers. 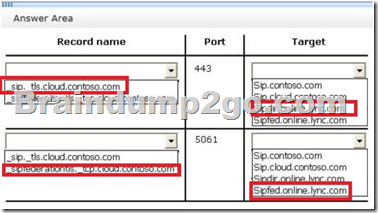 The Lync Server 2013 infrastructure is configured to use federation with users at a partner company, which is named Contoso, Ltd. Contoso has a SIP domain named contoso.com. Litware has a Microsoft Exchange Server 2010 Service Pack 2 (SP2) organization. Unified Messaging (UM) and Lync Server 2013 are integrated. 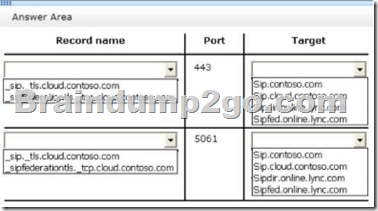 – The current firewall configurations allow all ports and all protocols to the Lync Server 2013 infrastructure. – The Enterprise Voice solution must ensure that calls to Canada are routed through the SIP trunk in the Montreal office. Litware identifies 39 area codes and a country code of 1 for Canada. – The provider of the New York SIP trunk requires that the Oil prefix be used to make all international calls. Rules exist to ensure that dialed numbers conform to E.164 standards. – Application sharing for up to 200 simultaneous remote users and 100 simultaneous internal users in a single conference must be supported. 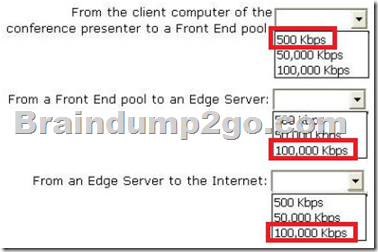 Each application sharing session uses 500 Kbps. Only users on the internal network are presenters of the conferences. – Microsoft Lync Phone Edition devices must be supported. – Users must be able to access their voice mail only from the Lync client by clicking Call Voice Mail. An administrator makes several security changes to the firewalls. After you deploy Enterprise Voice, remote users report that they fail to access their voice mail by using the Call Voice Mail option in the Lync client. You verify that the users can access their voice mail by dialing the subscriber access number. You need to ensure that the users can access their voice mail by clicking Call Voice Mail. You need to identify the minimum amount of bandwidth required for each network connection to support the technical requirement for application sharing. 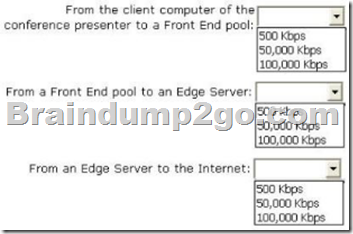 2015 Latest Released Microsoft 70-337 Exam Dumps Free Download From Braindump2go Now! All Questions and Answers are chcked again by Braindump2go Experts Team, 100% Real Questions and Correct Answers Guaranteed! Full Money Back Guarantee Show our Confidence in helping you have a 100% Success of Exam 70-337! Just have a try!